Like, I imagine, many knitters, I have a lot of handknit sweaters. I also have very limited space. This year alone, I’ve added seven sweaters to my wardrobe, plus a sweater vest. And I’m in the middle of Arboreal. And I have yarn set aside for several other sweaters. I’m pretty sure that I’ve crossed the line into Too Many Sweaters. 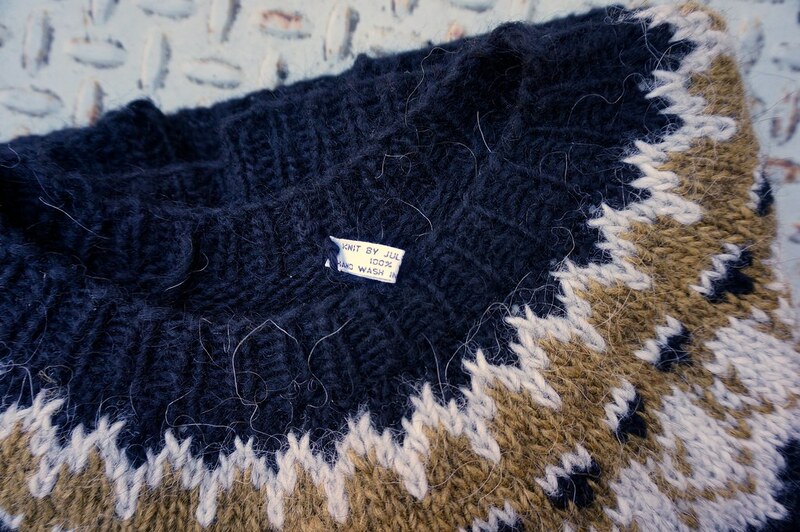 In theory, it’d be nice to give away a sweater for each new sweater I make, but I know that’s not going to happen. Even if, for example, my Fireside Pullover doesn’t get worn very often, I like it a lot. I’m not ready to give it away. But there are a couple that I don’t feel especially attached to, like my black and gold Strokkur, which I finished last November. I actually got a lot of wear out of this last winter, but I want to keep my Swans Island Strokkur. Plus I have two other Léttlopi sweaters, and at least one more on the way. This was kind of an obvious choice. I have a coworker, who is approximately the same size as me, so with any luck, it’ll be #newsweaterday for Jamie tomorrow.